Having trouble keeping your family on track? Sick of losing items and not getting messages? 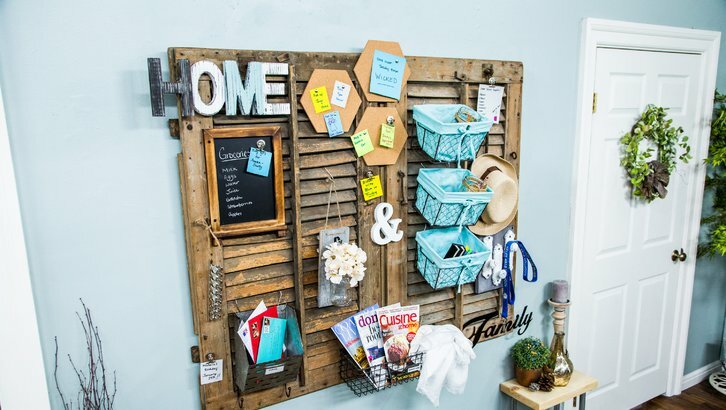 My DIY Command Centre has everything you need to keep you and your household organized. 1. Decide where you’d like this command center in your home. Then go on the hunt for some old shutters that will fit. sand paper to rough them up to look rustic! you have, I’ll just run you through what I did to create mine! using wood glue and your screws and screw gun. “Home and Family”. It will vary depending on each item how you attach them to the shutters. Some will need hot glue, some will need screws, some will need hooks, etc. want to be able to load it up, so make sure you find the studs before you hang it! 8. Fill/hang your baskets and knobs with mail, magazines, etc. 1. Don’t worry about your items matching! You can go true shabby chic and mix colors or use paint to make them all cohesive. 2. Don’t feel like you have to follow my “recipe” here exactly. Look around the house, in your crafts, in your garage, and under cabinets to find fun things to incorporate!